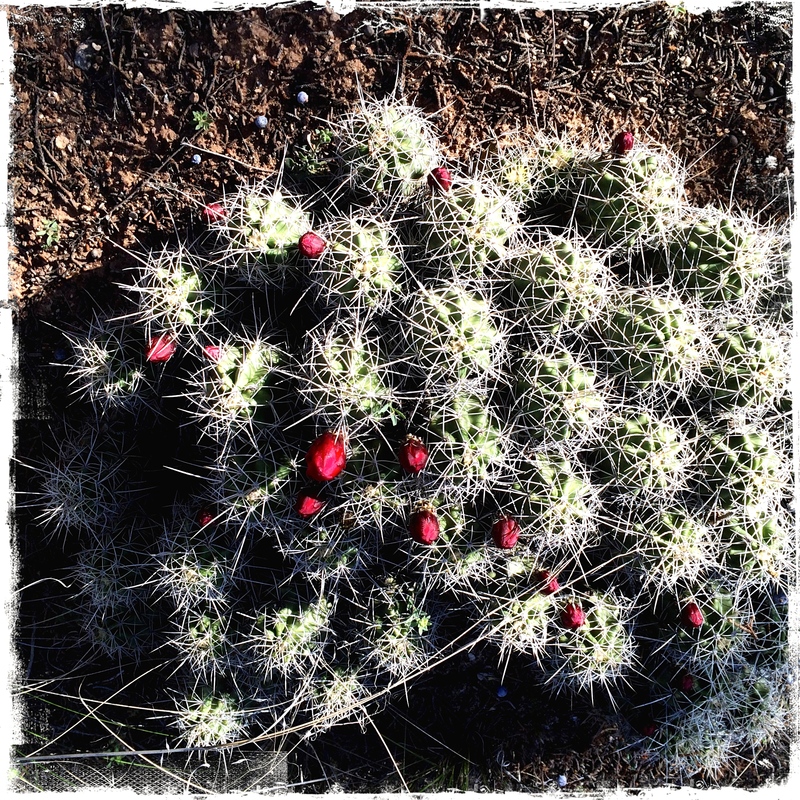 Claret cup cactus in the woods are full of buds from all the rain. This morning I planted five morning glory seedlings under the old cat ladder, a rickety wooden ladder to nowhere that makes a perfect trellis for morning glories. I had them there a few years ago and we hoped they’d reseed but they didn’t. Then I planted three nasturtium seedlings that were crying to escape the confines of their plastic tray. We’d had an hour of broken sun, and in this unusually rainy, cool May it felt great to get a few of these starts in the ground, even though it’s not a biodynamic flower day until tomorrow. I just couldn’t wait. Five flats of tender seedlings, flowers and fruits, sat on the metal patio table catching what rays they could. The dark sky gathering in the south moved quickly toward us and I felt the first drops of rain. Good, I thought, a rain will do them good. As long as it doesn’t hail. No sooner had the thought escaped my lips than I heard ping! on the table. Ping! ping! I scrambled to prop the screen door open and dashed in and out bringing the trays to safety. Darnit. We’re definitely going to have a short growing season this year, at least on this end of it. At least there’s plenty of water. So much water the fields are emerald green even before the irrigation’s turned on, luminous green below dark storm skies with just a shaft of sunlight streaming through. So much water weeds and bad grasses grow to seed faster than I can find enough dry hours to mow them. So much water the news stations warn of fungus marring lawns. So much water the irises have grown fifty percent taller than ever before, holding close their burgeoning buds day after day, sucking in all the moisture they may; surely they will burst open today! “Water, water, everywhere, nor any drop to drink.” A break in the main line from the Fruitland Mesa water treatment plant left us all conserving what we had in our cisterns over the weekend. No laundry, no dishes, no showers, no flushing, until we knew how long it would last. Just enough to drink and serve the animals, water plants that needed it most, and wash hands. It was ironic to wake up Sunday morning to emergency water measures, because Saturday I met the first California water refugees to arrive in our valley. In the harsh clarity of his statement the future flashed before my eyes. Further up the watershed. More people will be coming here from California, not this time because of land prices or urban sprawl or a back to the land movement, or even to grow legal pot, but because California’s running out of water. They’ll move further up the watershed. These young farmers have moved about as far up the Colorado River watershed as they can and still have any growing season for their carrots, beets, hops. For what good is moving further up the watershed if the source gets poisoned by hydraulic fracturing or wastewater injection? Among numerous deleterious consequences of “alternative” petroleum extraction methods such as fracking, watershed contamination ranks among the most alarming. There is no doubt it is happening, and there is no doubt the industry pulls out all the stops to deny it is happening in a shameful and intense propaganda campaign. Thank you Rita, for speaking out to newcomers, for being a voice for the Water, the Bees, and Mother Earth. Thanks, again and again, for bringing clarity to my day….. and thank you for encouraging membership in CHC and the CC. Would the Church like to have some membership brochures? If only you could direct some of that rain back to California! We are in need of several good soakings. I am not able to visit you so keep sending your beautiful pictures and your interesting commentaries.